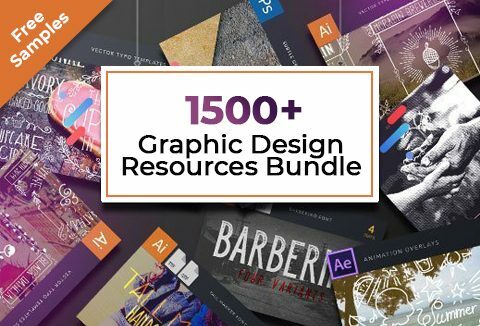 1500+ Graphic Design Resources Bundle Must-Have For Every Designer ! It's the most extensive and high-quality design bundle 100% editable in nature. So what is the wait for?? *Click on the images to see the larger preview. The 1500+ Graphic Design Resources Bundle is a massive bundle of hand-drawn typography, decorations, fonts, clip art, and textures. All the text is 100% editable, which means you can write anything you want instead of the placeholder text. Adobe Illustrator CS3 or newer (or Adobe Illustrator CC). It works both on Windows and Mac OS. The bundle is pretty big, so the download process may take a while. To use these files, you need Adobe Illustrator CS4+, Adobe Photo. All these files are suitable for both Windows and Mac OS. Extended License: The resources included can be used for personal as well as commercial purposes. It's a dream deal for every graphic designer out there. Now own it for a staggering 99% discount. Start creating beautiful artworks with these outstanding graphic design resources. At A Deal Price Of $29 Only!